Thanksgiving is a great time to add lots of healthy sides to the cornucopia of food being consumed this holiday weekend. If people are going to meet to socialize and break bread together why not provide them with lots of healthy fare. Not only will people feel satiated yet unstuffed but you’ll be showering them with lots of health benefits as well. It doesn’t take much to tweak some old standards and turn them into healthier fare. 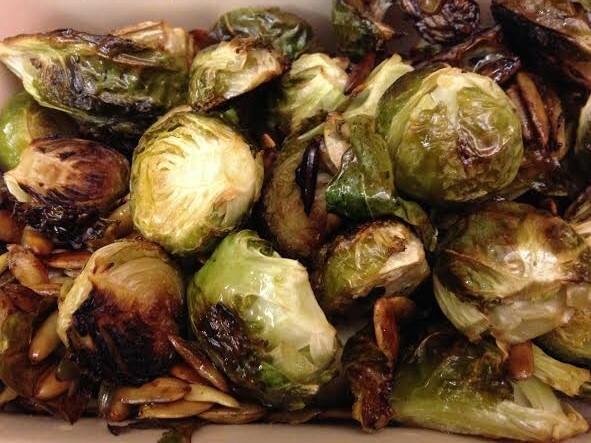 To give you some ideas, I’ve put together 10 of my favorite lean and clean holiday recipes. They’ve become such favorites that I use them all year round. Check them out and see if you find any of them tempting. You’ll find most of these are gluten free, and dairy free and they are all a great source of fiber. Why should you be concerned about fiber? According to the Mayo Clinic, and The Physician’s Committee for Responsible Medicine, most people eat only 15g of Fiber a day while the recommended amount for women is 25g and for men 38g. By doubling up on fiber you could trim off 10 pounds of weight a year. So fiber is a great way to keep your weight in check. A good thing during the holidays. So why not have sides on your table that provide nutrient dense foods and extra fiber instead of fat? 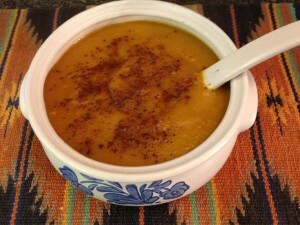 I LOVE butternut squash soup all year long but especially in the fall. Sprinkle with as much cinnamon or coriander as you’d like and garnish with pecans or pumpkin seeds on top (roasted if you have time) to make it a nourishing start to your family meal. Here is a link to my Butternut Squash and Apple Soup which also references my favorite Butternut Squash and White Bean Soup which is a great source of fiber and eliminates the need for milk as a thickener. 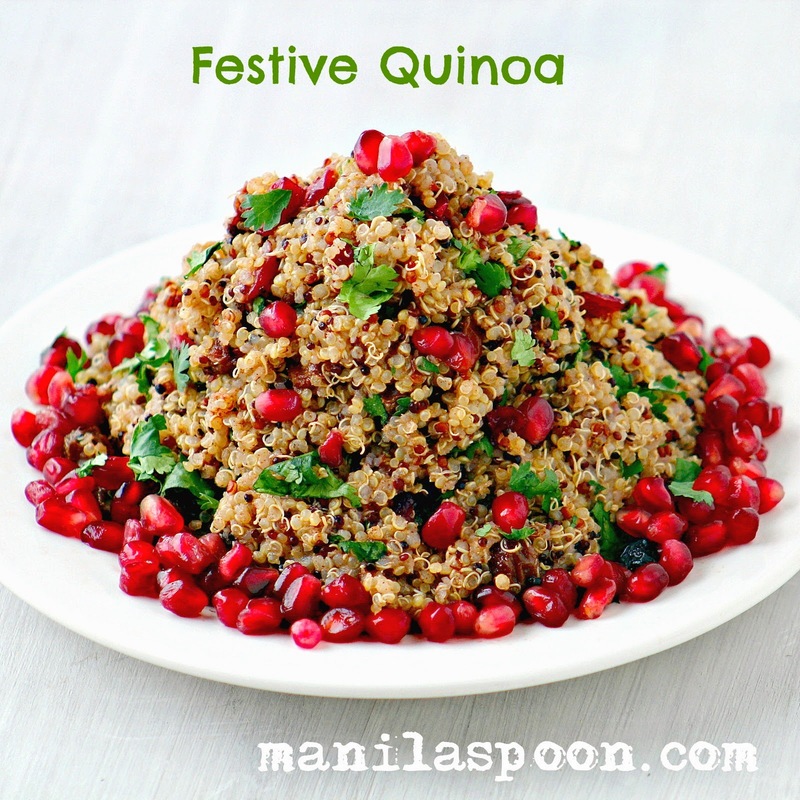 If you want an alternative to stuffing made with fatty sausage or cornbread try this Festive Quinoa recipe with cranberries, raisins and pomegranates. It’s a great source of protein, fiber and antioxidants. If rice is more to your liking try this gluten-free recipe made with wild rice and mushrooms. Wild Rice and Mushroom Stuffing from Detoxinista. If you’re looking for a new and healthy twist on cranberry sauce try this chunky cranberry chutney. If you don’t use it all for Thanksgiving dinner, leftovers go well with a high protein oatmeal breakfast the rest of the weekend. 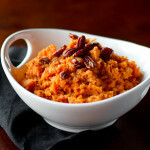 Whipped Sweet Potatoes from Rikki Snyder. 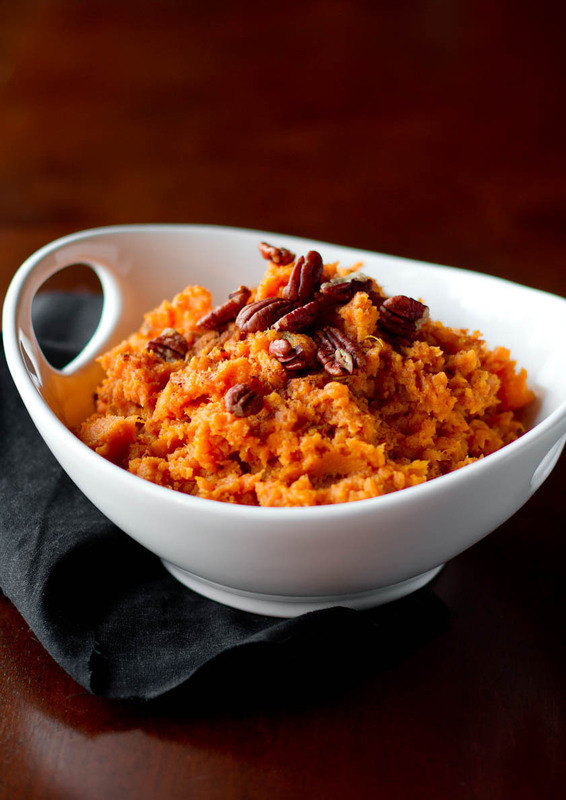 Baking sweet potatoes brings out their natural sweetness so you don’t need to overkill with sugar. This recipe has just enough maple syrup to add flavor. Mashed potatoes can contribute to weight gain for many people but you don’t have to feel deprived on Thanksgiving. Use Yukon Gold potatoes since their glycemic index is lower and by using unsweetened almond milk you can reduce the inflammation sometimes caused by dairy milk. When buying unsweetened almond milk look for brands such as SILK that contain no carageenan. Always read the labels. 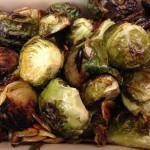 Some families can’t be without brussel sprouts at Thanksgiving. Here’s a version that is apt to make fans out of those who aren’t yet sold on these high nutrient little veggies. Green Beans with Lemon Almond Pesto from Oh my veggies. Green beans seem to be a staple of the American Thanksgiving but going with a green bean casserole topped with onion rings can pack on a lot of calories. Here’s a healthier version with lots of flavor. Stuffed Acorn Squash can be a meal by itself. I like to substitute quinoa for the rice in my recipe and by adding red kidney beans I can have a complete meal once Thanksgiving is over. This recipe is also a good dish to have for families with vegetarians who may not want to eat any turkey. a great alternative to Thanksgiving pies. You can even make it without the crisp for a delicious and light fruit desert. Just sprinkle raisins and walnuts on top before baking. Yum! I made her Baked Apples version without the crisp using 4 Gala apples and I used orange juice instead of apple juice. Sprinkled with walnuts and raisins it was a delicious ending to any meal. May your holidays be healthy and happy!